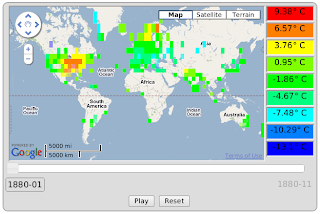 Unfortunately only 1 GPolygon for each Placemark would load. So I re-wrote the Perl script to output encoded polylines instead of latitude, longitude coordinates. I also wrote a Perl modulino (ISC License) to convert a set of coordinates to an encoded polyline string. The backend was rewritten to output the data in JSON instead of a kml. The frontend was rewritten to create GPolygons using the encoded polylines. This time all the polygons were created correctly. The first date I tested was 1880-01 with around 200 temperature grids. With this many grids, the tab running my map consumed over 300MB of memory. Therefore, I didn't even try loading the most recent date, as it probably had over 2000 temperature grids. My conclusion from this project is that only a few polygons can be created on a Google Map. Here is a screenshot of the application. Note that the date range is only from 1880-01 to 1880-11 so the temperature range is quite small.